Vitamins are necessary for a healthy life. A proper diet can supply all the vitamins that our body needs, but vitamin deficiencies can result from diets that do not include a variety of vegetable and animal products. People who don't eat animal products for philosophical reasons (vegans) need to take Vitamin B12 supplements to avoid deficiencies that can cause anemia or nervous system damage. The sale of vitamins in the United States is a multi-million dollar industry. If you turn on the television at dinner time, you are likely to see many advertisements for vitamin pills and dietary supplements. Many people self-medicate without consulting a dietitian or nutritionist and try to compensate for their bad diets by taking daily doses of vitamin and mineral supplements. Also, many doctors find it easier to recommend vitamin pills, rather than educate their patients about nutrition. Experimentation with large doses of vitamins was proposed by Nobel Laureate Linus Pauling, who claimed that gram quantities of Vitamin C could prevent colds and cure cancer. Further scientific studies found that Vitamin C was not effective for colds or cancer. There is a lot of popular appeal for the idea that if a little is good, more must be better. But this is not so. A healthy body can only be maintained through moderation. Vitamin A is a fat-soluble vitamin that is found in carrots, green leafy vegetables and liver. Vitamin A toxicity develops after taking too much vitamin A for long periods. Excessive vitamin A intake is associated with increased risk of fracture. Some of the symptoms of hypervitaminosis A are blurred vision, bone pain or swelling, and abnormal softening of the skull in children. 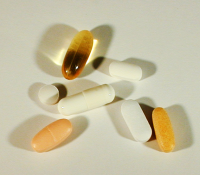 What vitamins or minerals should you supplement? Start by using a free web application for tracking your nutrition such as CRON-O-Meter. Enter the foods and the amounts that you eat in a typical week. When you have data for one week, you can determine the deficiencies in your diet, and only then can you decide what supplements to take. Most people find that they only need to supplement magnesium. Calcium may also be necessary for those who don't consume dairy products regularly. A detailed analysis of the foods that you eat can lead you to make more nutritious choices. Zile M. Vitamin A deficiencies and excess. In: Kliegman RM, Behrman RE, Jenson HB, Stanton BF. Nelson Textbook of Pediatrics. 18th ed. Philadelphia, Pa: Saunders Elsevier; 2007:chap 45.